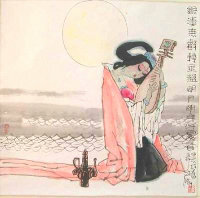 Listed as one of ten best ancient Chinese music pieces, Flute and Drum at Sunset (Xi Yang Xiao Gu, Pipa,夕阳箫鼓,琵琶曲) is one of the representative works of ancient Chinese lute music. The author is not known. Beginning to be popular as early as in the Ming and Qing Dynasties, the music’s name was first seen in Textual Research of Contemporary Music compiled by Yao Xie (1805-1864) in the Qing dynasty. Play Flute and Drum at Sunset (Xi Yang Xiao Gu, Pipa,夕阳箫鼓,琵琶曲) with HTML 5 Player, no flash required, no software required.